Lightroom 5. As far as we could get with a permanent license on a Cloud-connected computer. We tried that a few times, always with the same result. So we reinstalled Lightroom. Same thing. What had changed, we wondered. On July 10 our original Creative Cloud subscription was renewed for another year. We hadn't used Lightroom since then, but we'd been using our Cloud products. We asked our contacts about this and were routed to the usual Adobe help resources, including a live chat. You're laughing. What we wanted to know was simply whether there was a glitch in our account or if this was the new deal. The new deal being that if you have a Creative Cloud subscription, you run Lightroom under that license, not a permanent license. Even if you have a permanent license. That makes some sense. If you shell out for the subscription, why would you pay extra for the permanent license? You get Lightroom 5 with the subscription. One reason you would pay for the license is you took our advice. We advise owning Lightroom so you can access your edits in the Lightroom SQLite database without relying on a subscription. When you work on your images in Lightroom, the changes are stored as recipes in a database only Lightroom fully understands, not with the images (unless you export the edited images). So you're hosed if you rely on the subscription and you let it lapse. Another reason is that you already have a Lightroom permanent license and subsequently subscribed to the Creative Cloud. We've confirmed we can run Lightroom 5 with the permanent license on a computer that does not have the Creative Cloud files installed. And we've confirmed we can't run it on a computer with them installed, even though we used to be able to do just that. We suspect we could run Lightroom 5 on the Cloud-connected computer if we simply activated it from the Cloud, but haven't tried it. Because, you know, that isn't how we want to roll. We don't know why exactly we can't run it on the Cloud-connected computer. But we'll let you know. We wrote the above during our first Live Chat with Adobe Tech Support. After running around in circles for a while, they were unable to shed any light on why we couldn't launch Lightroom despite our permanent license. We tried again later. A very lightly-edited transcript of our extended second attempt follows. All representatives are actively assisting other customers. There are 1 customer(s) in line ahead of you. Thank you for your patience. You are now chatting with Alpana. Alpana: Hello! Welcome to Adobe Customer Service. Alpana: How are you doing? Alpana: I am great . Thank you for asking. Alpana: As I understand correctly you are not able to launch your product(LR 5),Am I correct? Mike: I can launch it on my travel computer which does not have the Creative Cloud subscription active. But I can't launch it on my main machine with does have the CC sub. Alpana: Alright Mike,I will be glad to assist you. Alpana: May I please have your email address registered with Adobe? Alpana: Thank you Mike, May I please know the serial number for the product? Alpana: Thank you for information. Please allow me a moment while I pull up your account details. Alpana: Mike,This concern is not under my expertise, please stay online so that I can transfer you to install team, Are you okay with it? Bharati: Hello. Welcome to Adobe Technical Support. Bharati: I have received your query. Please allow me a moment to verify your account and to review the details of your request. Bharati: I understand that you are unable to launch Lightroom 5 on your Mac OS X Lion machine. Am I correct? Mike: Partly correct. I cannot launch it on the Cloud-connected computer. On the computer that does not have my Creative Cloud sub active, I can launch it. Bharati: Thank you for confirming the issue. Bharati: I will [be] glad to check and assist you with the information. Bharati: Are you getting any error messages ? Mike: When I enter the serial number, the green check mark confirms it is correct but when I click the Finish button, LR simple quits instead of launching. Bharati: Please click on Spotlight ( located at the top right corner of the window with the magnifying symbol ) and type Lightroom 5. Bharati: Then launch the software and check if it still asks the serial number. Bharati: Let me know once you are there. Bharati: Then rename the OOBE folder to OOBEold. Bharati: Once you have done, please install the CC desktop application. Bharati: Then try to launch the Lightroom 5 and check if that works. Mike: I have the CC app running -- but I do not want to use the subscription license to run LR 5. I want to run LR 5 from the permanent license. Is this not possible? Bharati: Yes, please close the CC app. Bharati: Then launch Lightroom 5 and click on License this software. Bharati: Then enter your Adobe ID and password and sign in. Mike: I'm confused. I have Quit the CC app. I have launched LR 5. I am looking at the License screen again. Bharati: Please click on the License this software. Bharati: Sign in to your Adobe account. Bharati: Then enter the serial number and click on OK.
Bharati: And check if it is launching the software. Mike: You are not understanding what I wrote. I do not want to log into my Adobe account for LR 5. I want to run LR 5 without accessing my Adobe account, using the permanent license. Is this not possible? Bharati: If you agree that I need to control your computer to troubleshoot your issue, I will perform actions remotely under your supervision. Mike: I do not agree for confidentiality reasons, sorry. Bharati: Can you try installing the software again ? Mike: I have done that earlier this morning. Bharati: Please let me know the window that you are getting as soon as launch the software . Mike: It's the License or Try window. Bharati: Yes, please click on the License this software. Mike: The only option is "I have serial number and want to license Lightroom." When I continue using the Next button, I enter the serial number and Finish but LR 5 quits. Bharati: You need to sign in to your Adobe account in-order to register the serial number in your account. Mike: There is no such option. Bharati: Then remove the Lightroom folder. Bharati: Let me know once you have done. Bharati: Please make sure you are deleting the Lightroom folder from user library folder. Bharati: Now, please launch Lightroom and check if that works. Mike: It does not work. Exactly the same problem. LR quits. Bharati: I am sorry for the inconvenience caused to you. Mike: The Lightroom 5.0 Registration file is written to a new Lightroom folder. Mike: It appears LR 5 cannot be run from a Cloud-enabled computer using the permanent license. Bharati: No, Mike. 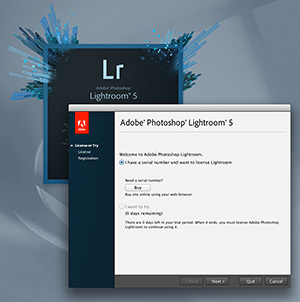 You can use the Lightroom 5 perpetual software on a computer which has creative cloud software. Mike: I would expect so but as you can see, I am unable to do so. Bharati: I do understand your concern. Bharati: Can you stay online for 2 - 3 minutes while I check on this information for you? Bharati: Thank you for staying online. Bharati: Please open the creative cloud desktop application. Bharati: Then Signout from CC app. Bharati: Then try to activate the Lightroom application. Mike: Same problem. I enter the serial, get the green checkmark, Finish and it quits. Bharati: Then expand the Sharing and permission category. Bharati: Then check if your user name (with which you have logged to the computer) is available. Mike: Yes. Read & Write. Mike: The file Lightroom 5.0 Registration is being updated with my current serial number. Bharati: Then click on gear sign and select Apply to enclosed items. Mike: Wait. Even though I am able to write to the Lightroom folder? Bharati: Now, please try to activate the software. Bharati: Would you like to share your computer screen so I can have view access to what you are seeing? Mike: No, sorry. I'm not free to do that. Bharati: Did you try installing the software from disc ? Mike: It is a download. No disc. Bharati: I have checked with the serial number provided above in the chat session and see that it is a dvd version. Bharati: Please try to install using the discs of the software and check if that works. Mike: And yet there is no DVD. Bharati: I request you try activating the software from a new admin account in your computer. Bharati: And check if that works. Mike: That, if successful, will not result in a useful configuration for me, where I will need to access external editors on another user account. Bharati: You can follow the steps mentioned in the above document to create a new admin account. Bharati: Mike, I request you please check if the software is getting activated on your new admin account for test purpose. Bharati: If the software is getting activated once on your computer, you will be able to launch the software on your old account as well. Bharati: Hence, please try to activate in a new admin account and check if that works. Bharati: If you face the same issue, you can contact us back. Bharati: You need to restart the computer in-order to login to the new admin account. Bharati: Is there anything else I can help you with? Mike: Is there a ticket number for this problem? While we don't mind diagnosing a problem with a few tests, we found several of these objectionable. And the folder renaming and permissions settings changes -- which would have affected other installed software -- were immediately reversed. We'd caution anyone against going as far as we did. We took some risks to try to get to the bottom of this. Our reward is the confirmation that it wasn't us after all. As we noted about two-thirds of the way through the transcript, "It appears LR 5 cannot be run from a Cloud-enabled computer using the permanent license." Since our support chat, we've received a couple of no-reply emails reminding us we haven't pursued the issue. Indeed, we haven't. Support doesn't know whether you can run a permanent license Lightroom on a Cloud-connected computer or not. And that's all we want to know. We aren't interested in experimenting further on our dime. Instead, after the release of v5.2 as a release candidate, we installed Lightroom from the Adobe Updater menu. That installed what we take to be the Cloud-licensed version, not the permanent license (and in fact the serial numbers are different). Once we did that, we were able to launch Lightroom 5 again but it was starting from scratch, hoping to update our Lightroom 4 catalog. We still use Lightroom 4 for testing, so we want to leave that catalog alone. We simply created a new catalog for Lightroom 5. Been there, done that! Well, not with this subject but certainly with an online chat session that ran on and on and on and ended with no solution to my problem.